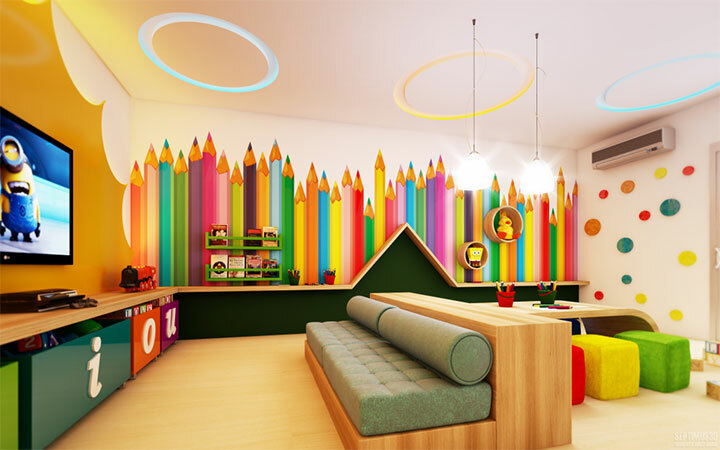 Some of the most exciting interior design projects are the ones that involve creating spaces for children. Loud graphics, bursts of color, oversize patterns are all fair game when decorating for kids. Even more, when it comes to wall treatments, the interior designer with artistic gifts is given the perfect canvas to put them to good use. But artistic gifts are not mandatory. Decorating walls for kids can be as simple as having fun with colorful stickers. 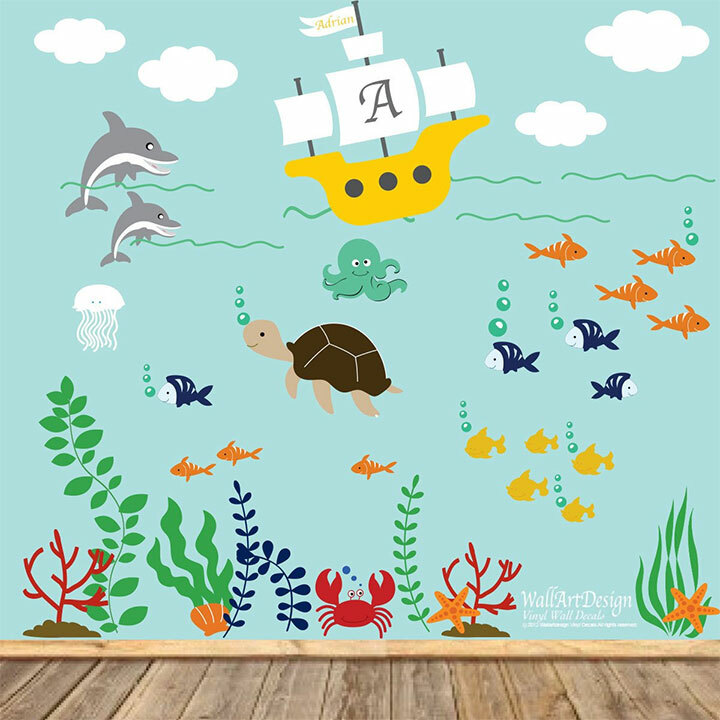 Here is, for instance, a set of vinyl wall decals for an ocean-themed room, that allows you to combine the self-adhesive pieces to create your own scene. Handmade, removable and printed with eco-friendly ink, these stickers can be customized to suit the size of your room. If you prefer a stronger impact and want to skip the step of creating your own wall decal artwork, using wall paper is an easy option that requires less time than painting characters. 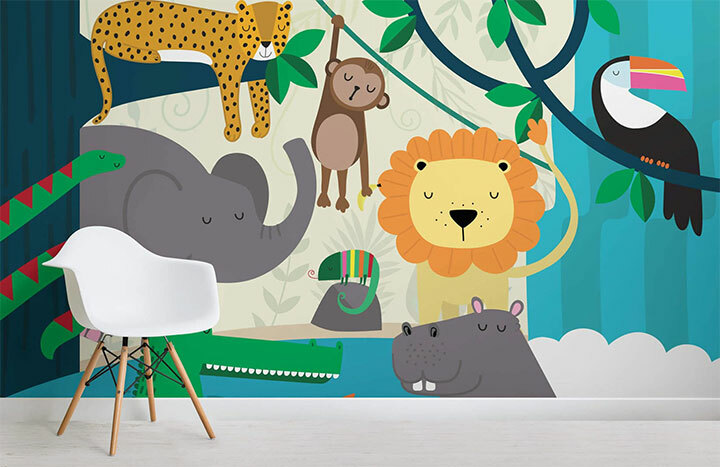 Here is a Jungle Friends wallpaper mural suitable for both residential and commercial spaces. If durability is of great concern, choosing a top-quality, paper-backed vinyl wallpaper is the best choice. If children outgrow fast their room decor, colorful wall treatments can easily be adapted to the tastes of older children. This imagery, for instance is perfectly suited to the walls of a school-age child’s room. 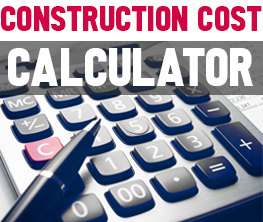 More importantly, it is an excellent option for schools and can be the solution for large spaces, such as hallways. When looking for wall treatments for kids that could also appeal to parents, choosing a personalized wallpaper is the perfect way to satisfy both age groups. For instance, taking a picture of your child’s hands and turning it into wallpaper is an ingenious way of making a space more personal, while using oversize graphics without the risk of falling into kitsch. 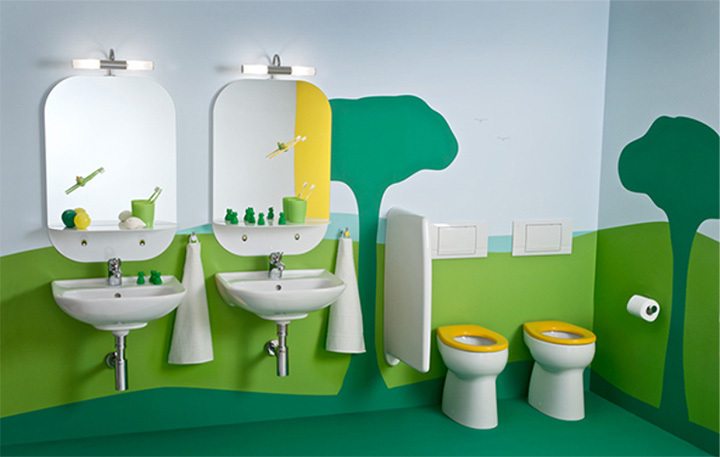 Do not overlook the potential of wall treatments for kids when designing areas like bathrooms. Such visual tricks may help children be more excited to use the facilities in order to develop such necessary habits as regular hand washing. Coordinating the bathroom accessories with wall graphics creates a strong visual impact. 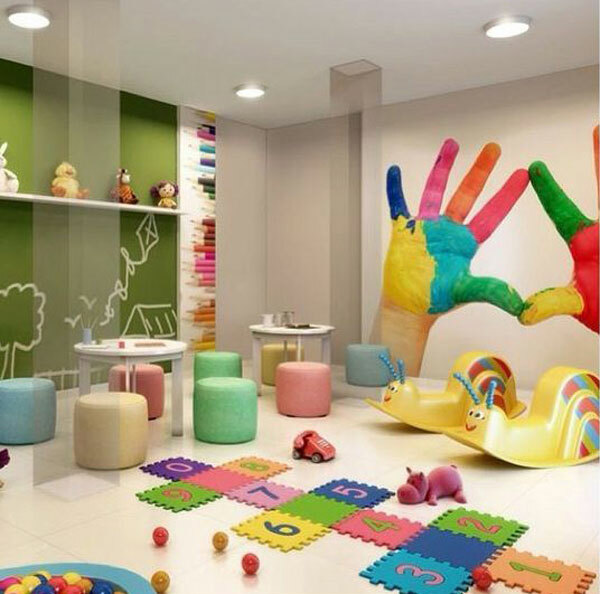 When it comes to colors, wall treatments for kids can also use a restricted color palette to create a relaxing environment by means of more subdued color choices. 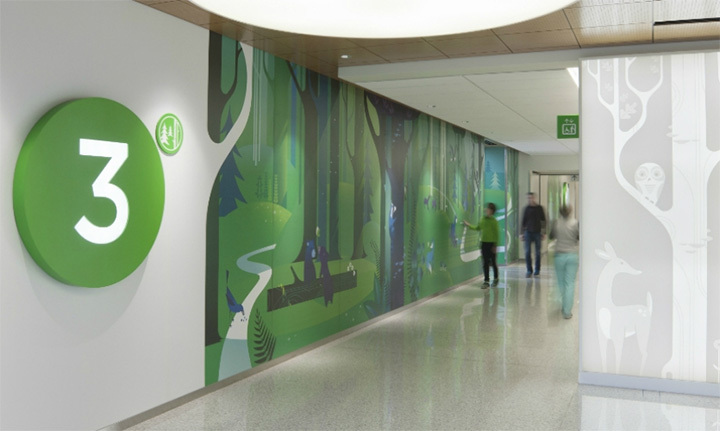 Seattle-based Studio SC used wall graphics to define different areas in the Seattle Children’s Hospital, making them easier to identify, helping to calm the little patients’ nervousness, and offering them a temporary mental escape. 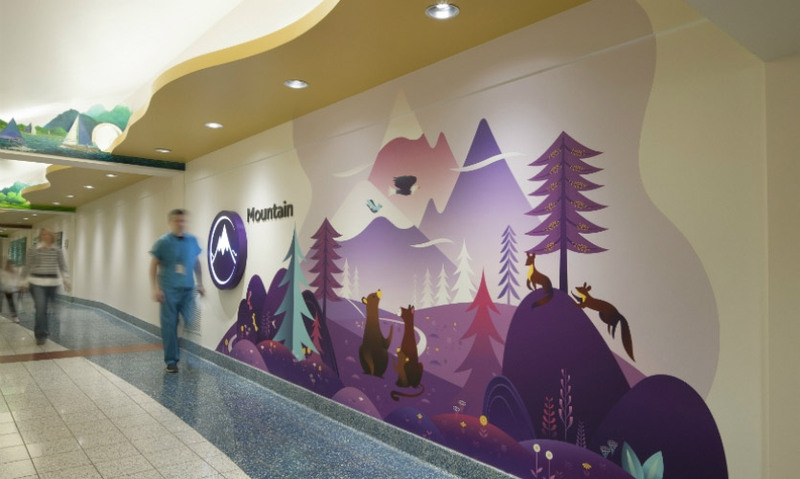 Their artwork proves that wall graphics for kids can be as tasteful as they are fun, and as comforting as they are colorful.